August 17, 2016 August 21, 2016 by Beau H.
Editor’s note: To recap the last time I hit the road, click here. A hot and sunny business trip to Las Vegas. Ivy Blazer by Grayers. Pocket square by J. Crew. Denim Shirt by JackThreads. Slim Stone Chinos by Taylor Stitch. Chukkas by Timberland. Mod Watch by Timex x Todd Snyder. Out of all the things that excite me about New York City and the chance to work in the menswear industry, there are certain parts of the job that just can’t be beat. Although I certainly hope to do a lot more, I’m pretty thankful and lucky right now that I get the chance to travel for my day job, and blog about that travel, at the same time. Such was the case these past four days , as I headed west to Liberty Fairs in Las Vegas; it’s a twice-yearly men’s fashion trade show that makes stops in NYC and Las Vegas, showcasing what’s new and next in the industry. That means everyone from fashion magazine editors to publishers, bloggers and sales representatives are gathered under one massive roof to scope out seasonal trends, post relentlessly on Instagram and of course, do business — everything from socks to shoes to outerwear is on display by brand. It’s a busy, hectic time, which didn’t leave much opportunity to sight-see. Although I experienced a bit of the bustle during New York Fashion Week: Men’s, hitting the road to travel and check out Liberty Fairs in a city like Las Vegas was another animal entirely. As always, that’s why I hauled my favorite #menswear essentials with me. Travel essentials fit for Vegas. Voyager Waxed Weekender by Owen & Fred. T-shirt by Public Rec Apparel. Capital Shorts by OLIVERS Apparel. Adventure Log by Word Notebooks. Mod Watch by Timex x Todd Snyder. Sunglasses by Steven Alan Optical. Belt by J. Crew. Lanyard by Tanner Goods. As I’ve been on the road a lot lately, my durable, rugged Owen & Fred Voyager Waxed Weekender has gotten a lot of work — and for good reason. If you don’t have a stylish weekender bag, and you’ve instead been relying on an old suitcase or a gym bag, making the switch is a mighty good investment. Unlike a recent trip to Michigan for a bachelor party, Las Vegas presented quite the different set of challenges — that would be the extreme heat, of course. Standard, sweat-wicking materials just wouldn’t do, though. With style in mind, I was happy to test out a new T-shirt from Public Rec Apparel. Known for its All Day Every Day Pant, the brand recently launched a super-soft, super-comfortable and super-durable T-shirt. The tee is made with a remarkable sweat-wicking fabric blend in a silhouette that still looks smart on its own or under a blazer — you can’t say that about your standard gym wear. And that tee was complemented nicely another staple that merges athletic performance materials with a tailored silhouette. Yes, the OLIVERS Apparel Capital Short was just the right pair to wear from New York and right into the Vegas heat — the shorts feature a nylon-spandex blend & four-way stretch, yet fit and looks like a pair of slim chino shorts. Those two pieces kept me comfortable, which was crucial for a long travel day. A Monday of meetings and menswear. Pocket Tee by Steven Alan. 505C Jeans by Levi’s. Ivy Blazer by Grayers. Mod Watch by Timex x Todd Snyder. Chukkas by Timberland. Striped socks via the latest SprezzaBox. Notebook by Word Notebooks. With my accommodations all set and a busy slate of trade show appointments locked in, it was time to hit the ground running on Monday. Throughout the course of a busy two days, it was excellent to be able to catch up with some great blogger friends like Leo of Levitate Style and Danielle of She’s A Gent. The duo was among a group participating in The Studios at Liberty Fairs, a partnership giving creatives the chance to create content — everything from photos to videos, portraits and social media posts — with brands and fellow influencers across three very busy days at the trade show. So given the need to look camera-ready, I tried to rise to the occasion while fighting the heat. A soft Steven Alan pocket tee was just the ticket in that regard — especially when paired with my Grayers Ivy Blazer, a casual linen-cotton jacket with unique patch-button pockets and a casual feel. 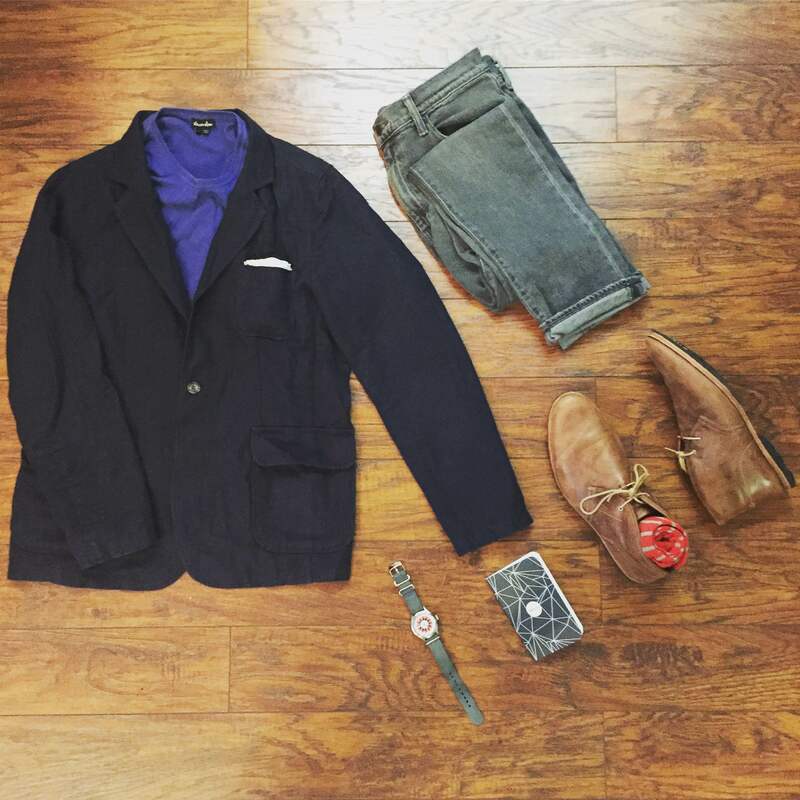 If you’re looking for a way to dress down your summer blazer, you can’t go wrong with a garment-dyed tee. The combo helped me move in style around the trade show, as did a pair of sharp-yet-edgy Levi’s 505C Jeans, made with a hint of stretch and featuring a faded grey-black wash. They’re a slightly cooler take (figuratively and literally) on heavy dark denim and a blazer, particularly when moving around a lot. 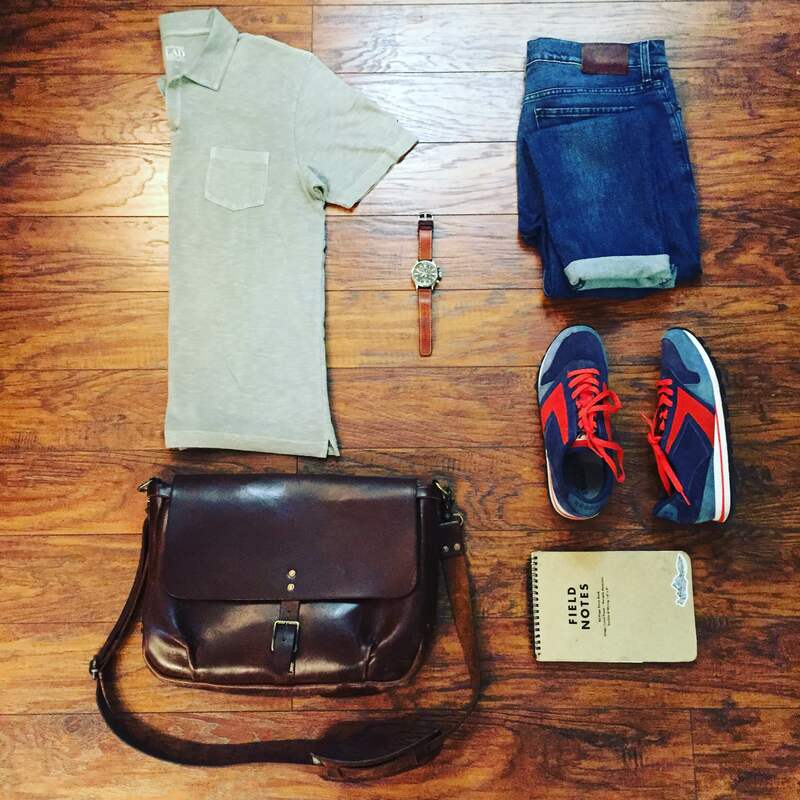 I finished off the combination with a pair of rugged Timberland leather chukka boots and my ever-dependable Timex x Todd Snyder Mod Watch, a frequent travel companion and just one of a few stunning watches from the Timex x Todd Snyder partnership. With Day 1 in the books, it was a quick turnaround for another busy day at Sands Expo at The Venetian scoping out the bustling (and hustling) crowd of #menswear aficionados. Throughout the day, I checked out the wares on display from perennial Style Guide favorites like Red Wing Heritage and (potential) soon-to-be favorites like Hudson Shoes. 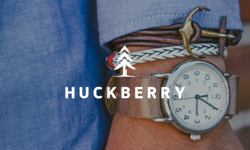 It was a great mix of brands, including everyone from accessories companies like Herschel Supply Co. to sock brands like Happy Socks. All the while, I again took on the day — and the heat — in style. I stuck with some of my favorite style essentials, like my JackThreads Denim Shirt (a very wearable shirt no matter the season). I complemented that with my Taylor Stitch Slim Stone Chinos — they’re unbeatable for the price and quality. And when you’ve got versatile staples like those two pieces, stylish Steven Alan sunglasses and sturdy leather chukka boots are a nice finishing touch (the pair seen here is from Timberland — you can snag a similar style from Thursday Boots for a nice value). On the accessories front, my ever-reliable Timex x Todd Snyder Mod Watch was the perfect timepiece for the occasion — it goes with just about everything thanks to the crisp retro dial and grey NATO strap. For being on time to various meetings and catching up with friends (all on the job), it helped keep me in line. That outfit combination worked well for the evening, too — it’s not every day you get the chance to attend a party thrown by the Hearst and Esquire teams (yes, that Esquire). Luckily, my smart-casual combination was able to take me from a day on the trade show floor to enjoying some delicious cocktails without missing a beat (that’s what we’re all about here at The Style Guide). 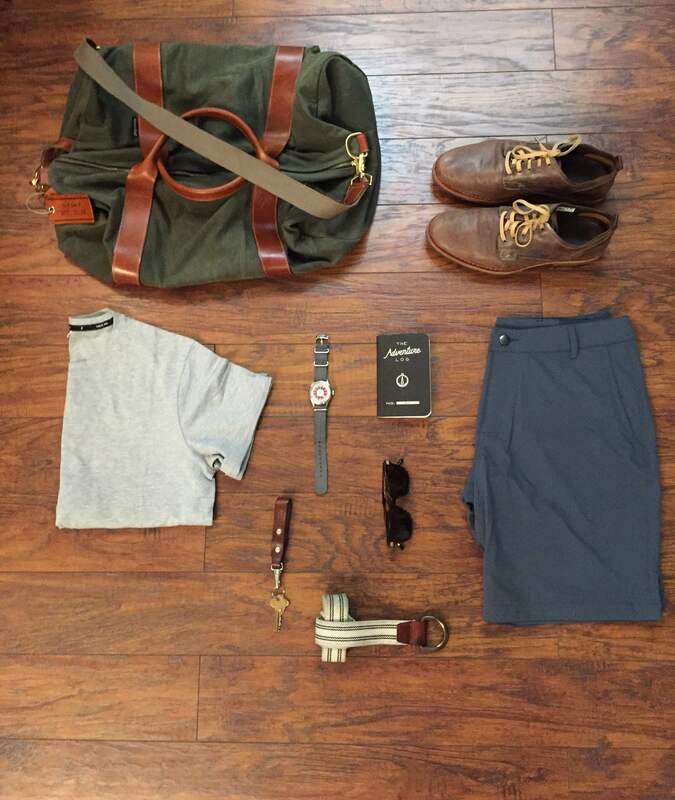 A comfortable, casual and crisp travel outfit. Polo by Life/After/Denim. Warren Denim by Mott & Bow. Chariot Runner Sneakers by Brooks Heritage. Waterbury Chrono by Timex x Red Wing Heritage. Steno Book by Field Notes Brand. Mailbag by Satchel & Page. Sadly, my time at Liberty Fairs came to an end all too quickly — today called for a flight back to NYC. For one last push through the heat of Vegas, I grabbed the aptly named Marco Polo from Life/After/Denim. It blends a modern fit with a garment-washed look and feel, plus an open collar (one featuring no buttons). The overall effect is breezy and casual, but it’s one that still looks put-together for a cross-country flight when teamed with the ever-stylish Slim Warren Denim from Mott & Bow. For only about $20 more than what the brand normally charges, you’re getting a well-fitting pair of Italian-made denim — they were the perfect complement to my lightweight Brooks Heritage Chariot Runners in color and silhouette. Throughout the day, kept track of my flight time with my Timex x Red Wing Waterbury Chrono and chronicled my adventures with my handy Word Notebooks Adventure Log — both of which you should bring along for a weekend getaway. As great of a time as it was in Las Vegas, it was even better to reconnect with great friends and fellow bloggers — plus, some terrific brands you’ll (hopefully) see a lot more of here and on my Instagram in the coming months. Forging partnerships and featuring great brands and products is terrific, but meeting great people in a like-minded environment is even better. Even though it’s been a heck of a busy week so far — and it’s only Wednesday (!) — my travels aren’t quite done yet. We’re looking at one day back in NYC before I hit the road on Friday to head back to my hometown of Mason, Michigan for my great friend Andy’s wedding. Seeing my friends for his bachelor weekend in Grand Rapids was an absolute blast just a few weeks ago, so this upcoming trip is bound to be just as incredible (even if it’ll be powered by lots and lots of coffee). 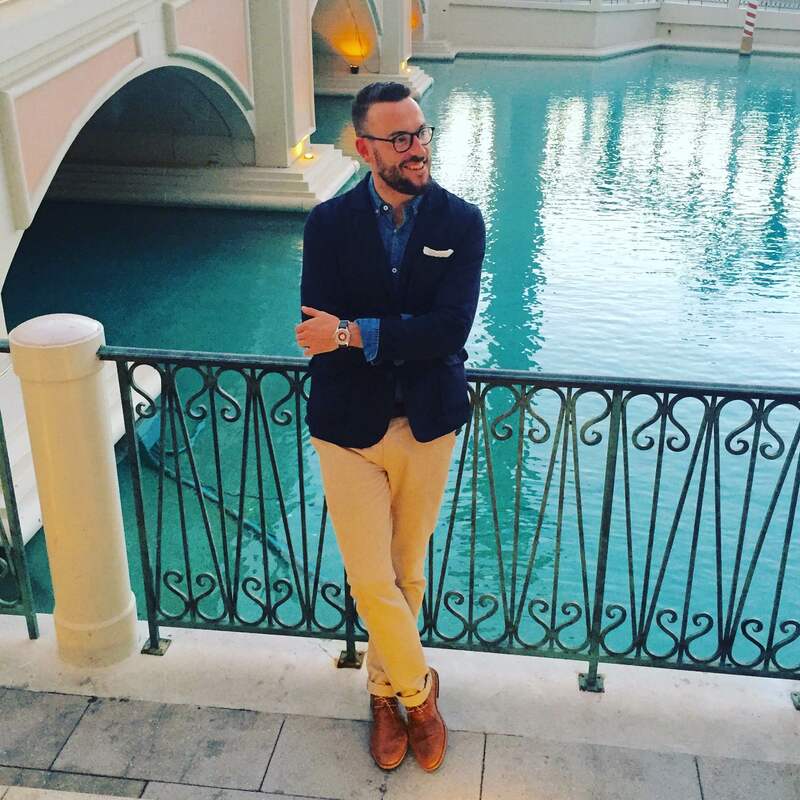 If you’ve got menswear musings or questions on what to wear for your next Las Vegas trip, shoot me a tweet on Twitter or follow along on the daily via Instagram. Look for the Friday Read and Style Pick later this week, and swing back through the blog on Monday for yet another Michigan trip recap — stay stylish!